Composites USA originated in Wilmington, Delaware in 1982 as a high quality fiberglass corrosion-resistant fabricator. With the acquisition of Jones & Hunt in 1994, Composites USA expanded their experience base back to the 1950’s. Composites USA is located in North East, Maryland with 50,000 square feet of manufacturing space. Our unique location between Baltimore and Philadelphia along I95 positions us to support most any production or site project. Composites USA is recognized worldwide as a technically advanced, quality driven manufacturer. 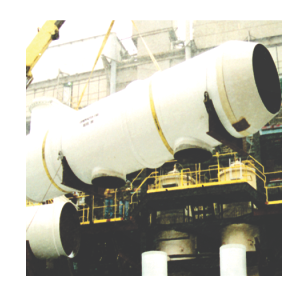 We specialize in critically engineered FRP equipment including FRP tanks, Scrubbers, Dual Laminate tanks, FM and UL approved duct. We are also the go-to choice for field service repair and installation regardless of the location. Another unique feature that sets us apart from many FRP manufactures is that we provide in-house assembly of duct and piping to lessen field installation time. We will do fabrication drawings or work from supplied drawings. Composites USA has the unique distinction of having the only FRP duct with a Factory Mutual (FM) stamp and a UL181 certification. This means that our duct can be installed without sprinklers since it has a Flame Spread rating of 5 on the inside/outside and a Smoke development rating of 10 on the inside/outside. No other manufacturer comes close to these scores. This is due to the fact that this duct is made with a phenolic based resin instead of a Vinylester resin. Due to our long history in the FRP corrosion industry, we have a stellar track record of delivering long lasting equipment to our industry’s most demanding clients. Our equipment is installed on six continents.